From fine dining to entertainment, our merchant partners offer Northside Platinum Club members exclusive, everyday savings. Simply present your key tag or card at the time of purchase to take advantage of our members-only discounts. See member handbook for a complete list of our merchant partners and their current offers. If you lose your keys, instructions on your key tag will assist in their safe return to you. Northside Platinum Club members always receive first priority when booking service appointments. Simply book your appointment online 24/7 or give us a ring, and we will handle the rest. Keep your vehicle looking as clean as it did the day you took delivery of it. Northside Platinum Club members will receive a complimentary exterior wash and interior vacuum for their vehicles at every scheduled service visit! As an exclusive Northside Platinum Club member, you are invited to enjoy a complimentary courtesy vehicle (based on availability) when pre-scheduling any Major Factory Maintenance Service. Simply call in advance, and we will have your vehicle ready for your arrival. Request our valet pick-up and delivery service, and we will pick up your vehicle from your home or office and deliver to you a rental car for your convenience. Let us keep your day moving with our complimentary shuttle service. Simply contact your service advisor to arrange the details. 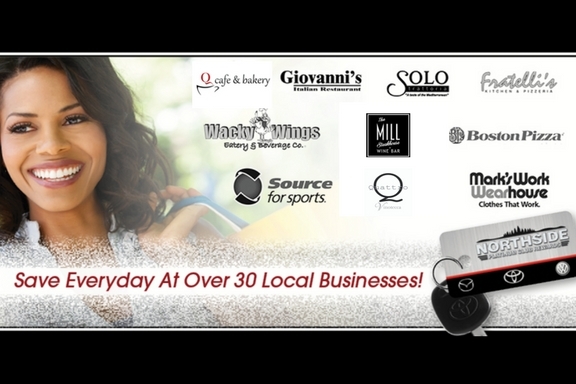 PLUS MANY OTHER VALUABLE MERCHANT DISCOUNTS AROUND TOWN!